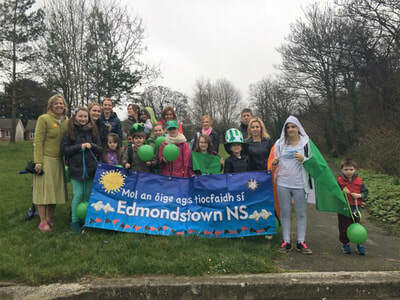 What fantastic news for Edmondstown – we have won the TRAVEL flag! This is really a fantastic achievement, given the location of our school. Well done to all those parents and children who made a huge effort to walk to school, particularly on Wednesdays. 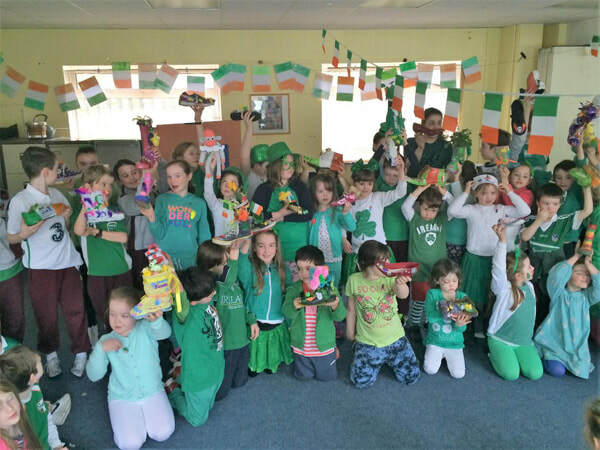 Thank you to Ms Deirdre Ryan and to Ms Emma Lane who were our Green School Co-ordinators for the two-year period it takes to work towards a flag. A huge congratulations to our hard-working committee over the two year period which included Cllr. Francis Duffy, Ms Linda Molloy and Valerie our caretaker, not to mention a lot of enthusiastic children. It’s wonderful what can be achieved when everyone works together. 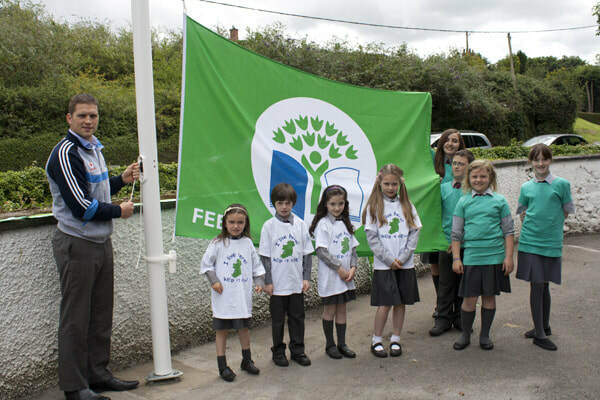 On Friday 22nd June 2016, Ms Catherine Martin T.D., one of our very own parents, raised our flag with the help of some of the children on the Green School Committee. Ms Martin spoke about what a wonderful achievement it was for our school and the important role that our children were taking in educating us all in Green issues. Check out the Photo Gallery for some great photos taken by Mick Behan. What a terrific Action Day we had on Wednesday 16th March 2016. The “Bling your Boot" competition really attracted some amazing entries. Check out the photos below and also in our Gallery. We had a moderate turn out for our “Walk on Wednesday” re-launch possibly due to the fact that people were getting ready for the competition and were running late. Those who did turn up were delighted to receive a balloon. Our application for our Fourth green flag has been submitted and we are keeping our fingers crossed that we will be successful. 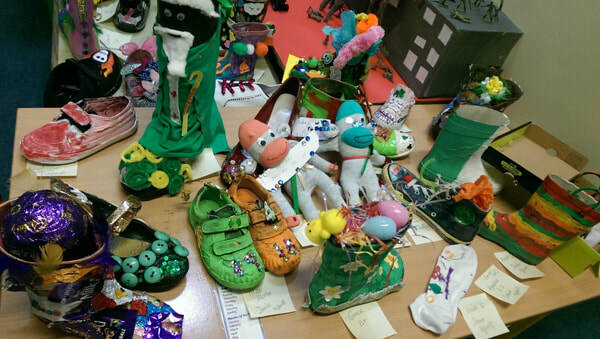 Keep up the walking on Wednesday and well done to fifth and sixth class who have won the “Golden Boot” numerous times. Well done to all those boys and girls who continue to walk or cycle every Wednesday. Some classes are better than others at winning the “Golden Boot”. Come on everyone – try your best! 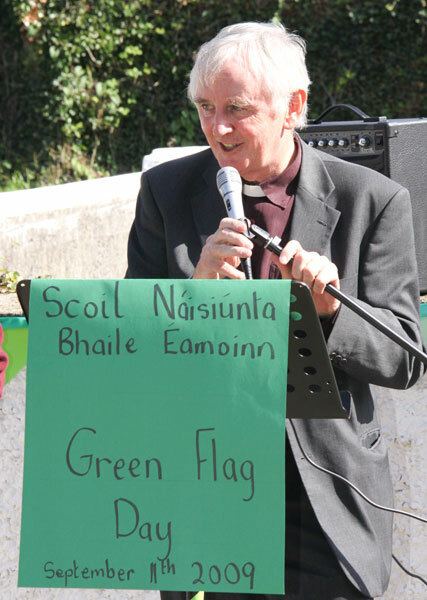 We really do want to achieve our Fourth Green Flag for Travel. Everyone who walks, car pools or cycles get a lovely sticker. Thank you to South Dublin County Council for installing ramps near the entrance to our school following our representations. Hopefully this will make it a little safer when we are walking along. Now if only they could widen and repair the footpaths…..!!! Wow it really was a WOW day on Wednesday 20th May. What an amazing turn out of parents and children and the sun shone beautifully as we walked to school. Ms Ryan , our Green School Co-ordinator was delighted with the turn out. Well done to everyone – keep up the great walking every Wednesday from now on!! 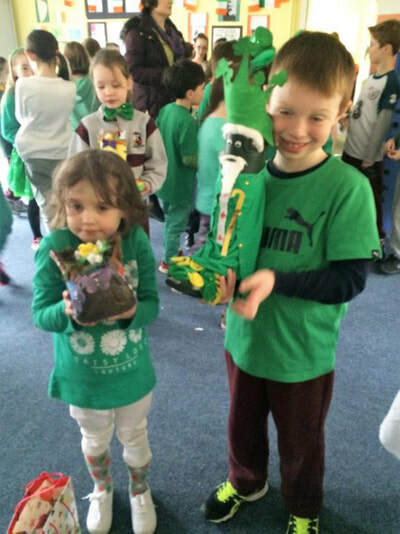 Fifth and Sixth class were the winners of the “Golden Boot” award as they had the highest percentage of walkers. Who will win the “Golden Boot” next time? We are currently striving for our 4th Green Flag. This is based on the theme of Travel. We are encouraging everyone to walk to school as often as possible, but particularly on Wednesdays – WOW days! If it is not possible for children to walk, we are encouraging parents to car pool where possible. 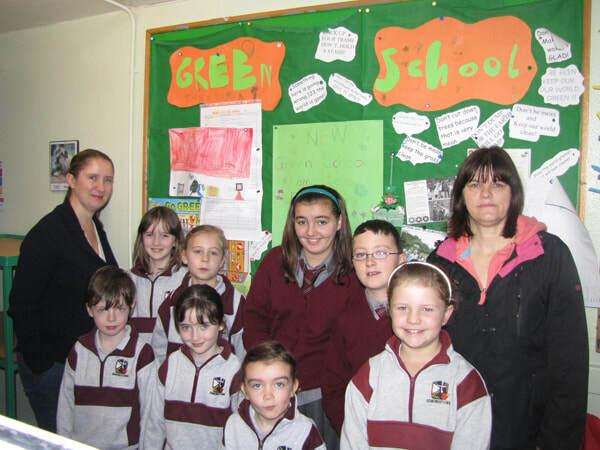 Our Green School Committee are very enthusiastic. On Wednesday 20th May we will be hosting a Park n Stride. We hope that as many parents as possible will park in Springvale Estate and environs, and then walk to school from there. Hopefully this will become a regular Wednesday walk for everyone. In this way we will cut down on our impact on the environment. The children of the Green Schools Committee contributed hugely to the event and each one either displayed a poster or spoke confidently to the assembled crowd about the steps that had been undertaken to obtain the flag. Clare Hinch from South Dublin Co. Co. praised the school community for their efforts and she encouraged everyone to roll up their sleeves for flag number three! The Guest of honour was Dublin GAA star, Conal Keaney who rose the flag with the help of the children and, who also cut the beautiful cake. The ceremony was capped off by the beautiful singing of the children’s own Green Schools song under the direction of Ms. Wallnutt. 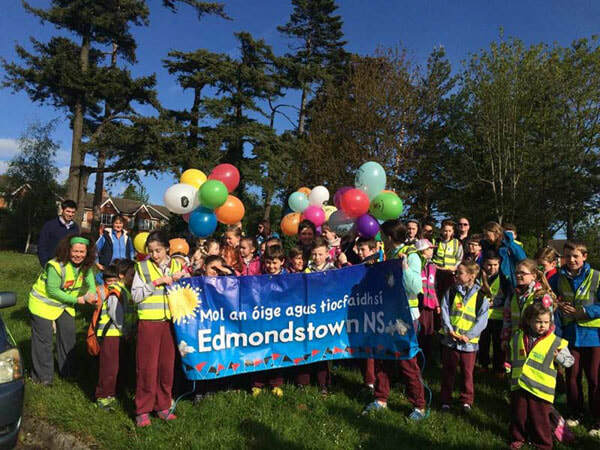 In his few words to the crowd, Mr. Burke thanked the entire staff and student body of Edmondstown N.S. for their encouragement and support of the committee. He especially thanked Ms. Fitzgerald for her tireless work on green issues around the school. The adult members of the committee (Valerie Atkinson, Cora Roche & Maria Kane) were also complimented for the important roles they too have played. The afternoon was rounded off by a small reception for the adults while the children tucked into some goodies back in their classrooms! Well done to all involved! 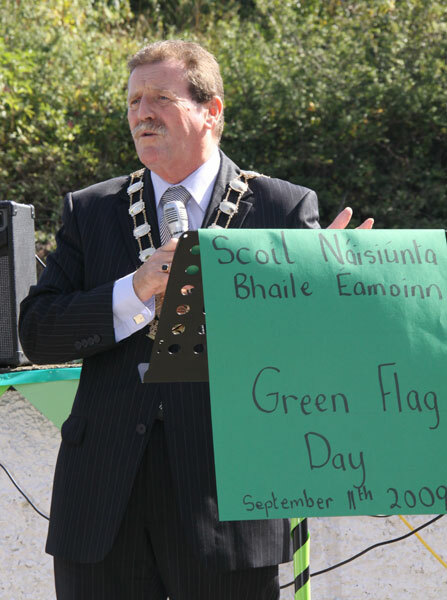 Mayor of South Dublin County Councillor Mick Duff.